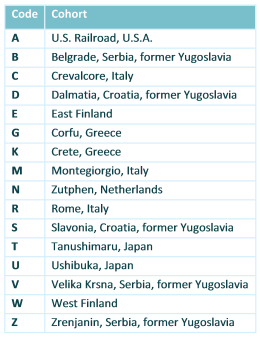 Average serum cholesterol level and CHD death rates in the 16 cohorts - Seven Countries Study | The first study to relate diet with cardiovascular disease. In the 1960s average serum cholesterol levels varied from 160 mg/dl (4 mmol/l) in the Japanese cohorts to 270 mg/dl (7 mmol/l) in Eastern Finland. The baseline serum cholesterol levels of the 16 cohorts were positively correlated with the CHD mortality rates after 5, 10, and 25 years. 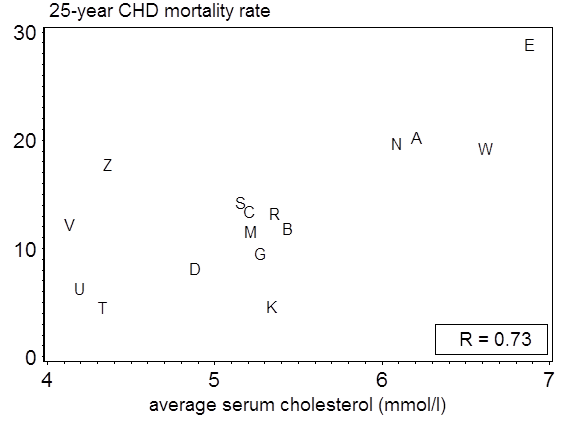 The higher the average serum cholesterol level at baseline the higher the CHD mortality rates. Cohorts with low serum cholesterol levels at outset, in which average levels rose during 10 years of follow-up had an excess risk of CHD mortality during the subsequent 15 years. These results indicate that both average serum cholesterol level and change in this level are correlated with CHD mortality rate in the 16 cohorts of the SCS. Individual 25-year risk of CHD death within SCS cohorts was also strongly related to serum cholesterol level (Read more). Because primary and secondary prevention trials have shown that reduction of serum cholesterol levels (with statins) reduced risk of CHD events and death, the totality of evidence is strong that serum cholesterol is causally related to CHD mortality.